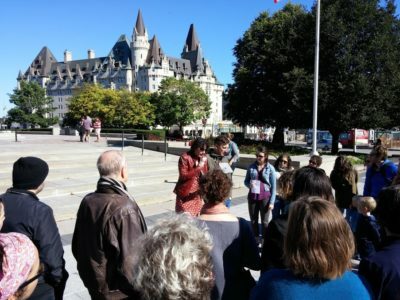 On a bright autumn day this past September, sixty or so members and friends of the Carleton community gathered in front of Ottawa’s City Hall to embark upon an experimental walking tour of our city’s parliamentary precinct. 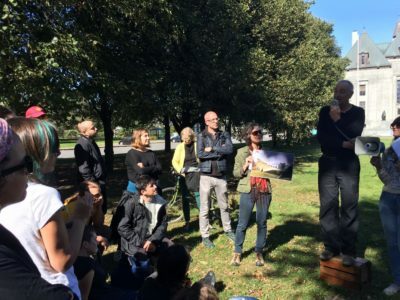 A dozen speakers staged short, five-minute provocations at eight sites of existing, proposed, or future memorialization. 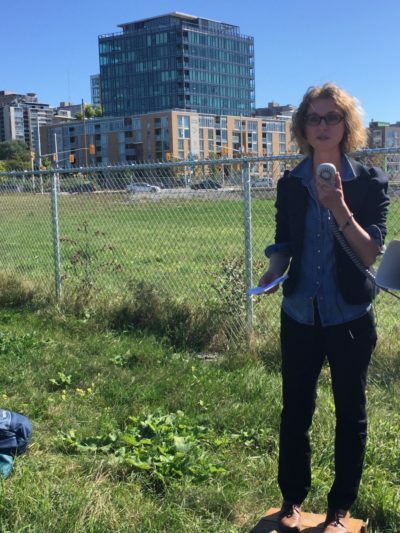 Standing on a soap box and speaking into a bull horn, speakers probed the palimpsest nature of Ottawa’s memorial landscape while bearing witness to counter-memories and hidden histories that official sites often obscure. 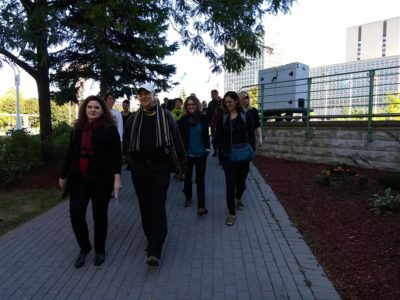 Our walking tour was part of a broader conversation taking place that weekend which included the opening of the art exhibition “Monuments to the Victims of Liberty” at AXENÉO7 and a symposium at the Université du Québec en Outaouais on the Commons, Counter Monumentality and Decolonization. In response to the Harper government’s controversial (and with the October 19th election of a Liberal majority, indefinitely stalled) proposal for a Memorial to the Victims of Communism, a group of publically engaged academics, artists, and activists from Montreal and Ottawa participated in this constellation of events. 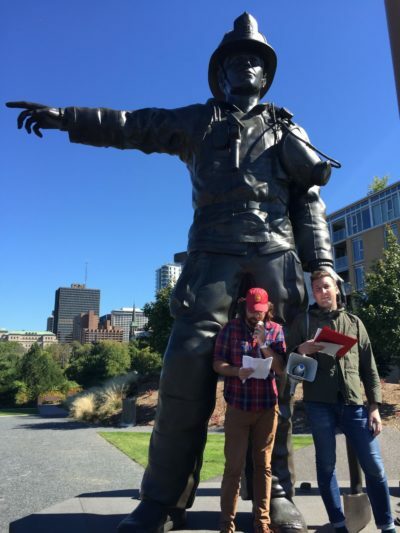 Our intention was to engage history in public, and to engage public history, in a playful, critical, embodied, and interactive way. 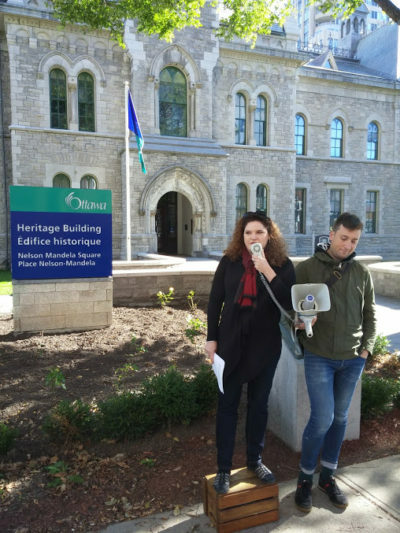 Traipsing through the symbolic cultural capital of Canada’s capital city, we explored the spatial history of memory practices in Ottawa as represented in memorials to the past, the politics of the present, and proposals for the future. I kicked off the tour with a stop at Nelson Mandela Square. Adjacent to the International Human Rights Monument where the South African leader stood during his 1998 visit to Canada, the square was commemorated in July 2014, a year and a half after Mandela’s death at the age of 95. Officiating the event, Mayor Jim Watson noted that “Mandela was a great leader and humanitarian who devoted his life to the pursuit of democracy and equality.” While few would disagree with this statement, it belies less comfortable truths that are often forgotten: namely that Mandela endorsed the use of violence and was active in the South African Communist Party. Memorialization relies on selective memory. Monuments are always political and designed to shape values. In importing the figure of Mandela as a human rights defender to Canada, the complexity of his political ideologies and apartheid’s realities have often been flattened. The sanitizing of the history of the struggle against apartheid elides the crucial role of the South African Communist Party (SACP) in both Mandela’s political career and the struggle more broadly. The erasure of the SACP and other Communist orientations in the branding of the South African “miracle” of “reconciliation” and the production of Mandela’s celebrity are part of age-old and hegemonic tendencies to represent comfortable and convenient truths. Reflecting on the ways in which the Famous Five’s commitments to rights and equality “extended only to some people at a cost of excluding and criminalizing others,” she invoked another famous five: The Security Certificate Five. “These are five men who, as noncitizens, have been held in custody first in prisons built specifically for them, then on extremely strict bail conditions. They are men whose legal and human rights have been denied. They are noncitizens who are accused of ties to terrorism and whose incarceration is on the basis of evidence that neither they nor their lawyers were allowed to access.” Arguing that legal tools like security certificates are part of broader discourses that work to instill fear of racialized men, Sabrah urged us to think about the ways in which these contemporary manifestations of denied personhood are also a part of the Famous Five’s legacy. 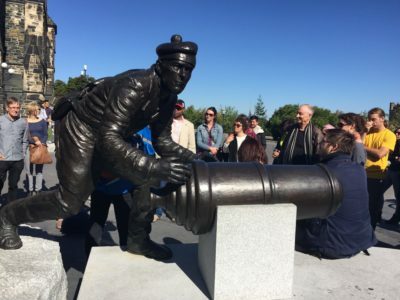 Urging us to consider this recent monument within a broader effort by the Harper government “to use a cold-war revival to boost their case for militarism,” McDougall reminded us that in its earliest attempts to establish its militaristic credentials, the Canadian ruling class waged war against the ‘enemy within’: Indigenous Peoples. Winding our way down the hill to the large empty field across from the Canadian War Museum, we stopped along the banks of the Ottawa River where Shady Hafez reflected on the divisive debates taking place around Windmill’s Zibi development project. Located on unceded Algonquin Anishinabe territory, like most of Eastern Ontario and Western Quebec– including Parliament Hill– the controversial project has ignited competing claims to indigeneity, and interference by self proclaimed allies. Hafez argued for the importance of giving Algonquin people the same space for complexity, disagreement, and diversity of interests that other communities are afforded, and urged allies to refrain from judging, co-opting, and speaking on behalf indigenous people. History is always selective. It always represents larger struggles, and always involves the romanticization and simplification of the past. For those interested in scratching below the surface of official narratives and generic forms, a walk through the memorial landscape of Ottawa yields many insights into the unresolved fissures of the past, the competing aims and interests of the present, and the attempts to harness and control the power of the future. Check out video clips in our evolving digital platform document the Profane Perambulations Walking Tour and on YouTube. Very educational and insightful. Makes you skeptical of historical “knowledge” you thought you knew.